Another Blogging from A to Z April Challenge has come to an end. Some of you are sad to see it end while others are breathing a sigh of relief. With the end of one month and the arrival of the first of another it's time for another Battle of the Bands, the blogging event first introduced by our friends at Far Away Series and StMcC Presents Battle of the Bands. This event happens twice each month on the 1st and 15th. The premise is simple: Listen to the songs presented below and then in the comments vote for your favorite and tell us why you liked it. Then visit the links listed near the bottom of this post for more Battle action. After this past frantic month of daily blogging I thought it might be nice to relax with a piece of slow classical music. Since this work is in French and by the French composer Georges Bizet I dedicate this Battle to some A to Z'ers who had themes about France this past year or in the previous year. Some of those bloggers are D.G. Hudson at Rainforest Writing, Forty c'est Fantasique, Evelyne Holingue, and A to Z Co-host Lisa Buie-Collard. And a special tribute to our Paris loving Battle of the Bands founder Far Away Eyes. Also I might add that this song is a favorite of mine and my wife. Georges Bizet is mostly known for his opera Carmen, but he wrote a few other operas including Les pêcheurs de perles (The Pearl Fishers). The opera itself was not highly regarded in Bizet's lifetime but has gained more critical acclaim since then. The beautiful aria featured in my Battle today has been recorded by numerous opera singers and in more recent years has found its way into the repertoires of pop style artists. I present two of these today. If you wish you can first listen to the traditional operatic version or you can scroll down to the two contestants of this Battle. Please don't vote on this one! I merely offer this version so you can get an idea of how this piece would traditionally sound as performed by an opera singer. In fact you don't even have to listen to this unless you want to put the other versions in perspective. "Je Crois Entendre Encore" (2000) DON'T VOTE ON THIS ONE EITHER! Keep scrolling past if you don't wish to hear operatic singing. The Anglo-French film production The Man Who Cried was released in 2000 to relatively tepid reviews. "Je Crois Entendre Encore" appears a number of times throughout the course of the film in essence becoming the film's theme song. This tearjerker film has a cast which includes Christina Ricci, Johnny Depp, Cate Blanchett, and Harry Dean Stanton. My wife and I both like this film a great deal, mostly because of the song being used throughout as well as the subject matter of Jewish oppression by the Nazis. This version of the aria is sung in Yiddish. And now for the real contest: Vote on these two only please! And as an introductory comment, these versions may seem much the same and they are in over all delivery. For some of you it might be a matter of a male voice versus a female voice. However if you listen closely you will hear a very distinct difference in the back up musicians. I'm taking this into account in making my decision. After I first heard a version of "Je Crois Entendre Encore" on the local public radio station I was so enthralled that I went to Amazon to seek out a recording of the song. What I'd heard on radio was an operatic singer with piano accompaniment. I was surprised when the first version I came across on Amazon was by David Gilmour, guitarist and vocalist of Pink Floyd. The song appears on his DVD David Gilmour In Concert. If you're a fan of Gilmour or Pink Floyd this is well worth seeking out. It's an outstanding release. My wife absolutely loves the way he performs the Bizet aria. She's never watched the complete concert, but we've watched this one song dozens of times. See what you think. This marks the second appearance on Tossing It Out by Alison Moyet who previously was featured with her version of Almost Blue. That was probably my least visited Battle with only 12 total votes and Alison only received one of those votes and that came from me, but that's no indication of how I'll vote in this current Battle. Since I have this one on CD I always bring it along on lengthy road trips and my wife has me play this one repeatedly. Actually since she likes just about every song on this album we usually listen to the entire album at least a few times with some extra listens of "Je Crois Entendre Encore." Take a listen and you be the judge as to how Moyet compares with Gilmour. Which do you prefer? David Gilmour? Alison Moyet? It's up to you to determine the winner. Please vote on your favorite by letting us know your choice in the comment section and tell us why you prefer the one you chose. Then after you've finished here, please visit the other blogs listed below who may or may not be participating this time around. And if you've put up your own BOTB contest let us know that as well so we can vote on yours. Get the final vote tally on my post of Friday May 8th. My A to Z Reflections post will go up on Monday May 4th. For information about that post be sure to visit the A to Z Challenge Blog. Then on Wednesday I'll be participating in another Insecure Writer's Support Group post. 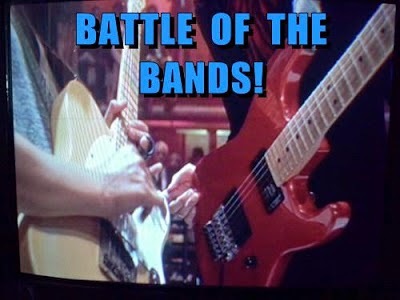 You can vote on today's Battle of the Bands post until Thursday May 7th which will be when I make my final vote tally. Please vote! Were you previously familiar with this song? Have you heard Bizet's opera Carmen? Are you surprised to hear David Gilmour performing an operatic aria in concert? Good morning, Lee! It's refreshing to listen to slow classical music for a change. It is a category about which I know very little, but that doesn't prevent me from appreciating it. I enjoyed these offerings of yours today. The first two videos, the operatic performances, brought tears to my eyes. They are hard acts to follow. For the last couple of years my ears have been tuned to female vocalists. On a daily basis I have listened to more female fronted bands, classic girl groups and female pop soloists than any other categories. In this battle the choice was not only between a male artist and a female artist. One video is a live performance and the other is a studio recording. I suppose I could have or should have closed my eyes while listening to the David Gilmour piece to avoid being influenced by the visual elements. I didn't. I couldn't. The spacious venue in which his performance took place, the musicians and the chorus all had an impact. All things taken into consideration, I therefore cast my vote for Pink Floyd prog rock star David Gilmour's interpretation. If you enjoyed the experience of Gilmour's concert in this clip then you'd probably enjoy the entire DVD. He covers a lot of Pink Floyd material and it sounds great with the ensemble he's assembled for this concert. This song is one that I never tire of hearing. I've gone out and purchased every version of the aria that I could locate. Such an exquisite piece of music. Thanks for your vote for Gilmour. On name alone I would have voted for David Gilmour. However, after listening to both versions Alison Moyet gets my vote. I liked her voice better. Also I like the way her version is orchestrated. There is a percussion instrument that gives it a very distinct sound. There is also a couple of other things I heard in her version that helped sway my vote. A beautiful song and a wonderful battle. We're off to an interesting start. I would expect Gilmour to capture this contest on the basis of name recognition. And Moyet did not do well with voters in the last contest she was in. But I think this one is different. I guess maybe the instrument to which you refer is the glockenspiel which I agree that along with the marimba gives the song a very nice touch. Thanks for your vote for Moyet. Carmen was one of my favourite operas - saw it when I was 12 -so I'm familiar with some of Georges Bizet's work. I have heard "Je Crois Entendre Encore" before and do like it, but have not seen "The Man Who Cried". Interesting cast! I'll check it out, for sure. LIke your previous commenter, my first instinct was to choose David Gilmour, but as soon as I heard the second version by Alison Moyet, my vote changed. She has a wonderful, mellifluous voice. ☺ I also liked the oboe at the beginning and yes, the percussion. The Man Who Cried is a rather obscure tearjerker of a film. I won't call it great, but it's enjoyable if you like that sort of film. And the repeated use of "Je Crois Entendre Encore" particularly endeared me to the film. Regarding the oboe, Gilmour's version has the oboe and I particularly enjoy that since the oboe is one of my favorite sounding instruments. I had thought that the Moyet version opened with an oboe, but then upon further research I discovered that the instrument is actually called a cors anglais which is very similar to an oboe but pitched a fifth lower. I'd never heard of that instrument prior to this discovery. Interesting! I'm not familiar with the cors anglais. Thanks for the education. Anyway, I thought it stood out a bit more in the second song intro. David Gilmour's version was good too, but Alison's magnificent voice really grabbed me. Awe Lee, thank you for dedicating your BOTB today to me (along with the other Francophiles, you mentioned). I am touched from the bottom of my heart when anyone dedicates some portion of their blog to me, but one that features such lovely music is extra special. Ce beau morceau de musique est celui qui rend mes yeux pleurent et chanter mon cœur de joie. Je adore Bizet et bien que je ne connaissais pas cette pièce avant aujourd'hui, il pourrait très facilement devenir un de mes favoris assez quickely. As is my usual routine, I start listening to the various BATTLES on my phone before I get out of bed. This morning I must run out the door very early to head down to Reno, therefore my own BATTLE and votes won’t go up until much later today, but I made the time to open up the computer and leave this comment, because I wanted to me among the first. I made the time investment to listen to every version you posted, something I don’t always do with songs that are NOT in the running, but after the first piece, I simply did not want it to end. Each was lovely in its own right and for different reasons. I really thought it could not get any better than the Gigli rendition, and will admit I was a little miffed that I could not vote for that one, until I heard the others. Something about the Yiddish version (the language alone, maybe) seemed even more heartbreakingly beautiful. I must see if that movie is available to rent somewhere. Now, onto the BATTLE at hand. Alison Moyet’s version is incredible. Her voice fits the piece wonderfully and there isn’t one bit of fault I can find here. I could put this version on repeat in my CD player until I wore a grove in the disc. BUT, David Gilmour’s turn with "Je Crois Entendre Encore" is incredible (I’m not sure why word has changed my font like this, perhaps it is to express its pleasure in David’s version of this song also. But, since I’m really pressed for time, I cannot fix it, and there is the chance that when I copy and paste this into your comment box, it will fix itself.) The orchestration, the faint yet expressive back-up choir, absolutely everything about this version really speak, or rather sings, to my soul. Please give David Gilmour my hearty vote in this, one of your finest BATTLE OF THE BANDS. A very sincere thank you again and again. Well, the font turned out fine and thank you for making a special effort to leave an early comment. I agree with all your thoughts here. Every version of this song is worthy and it's something I can listen to repeatedly no matter what the version. It is a beautiful piece of music. Thank you for your vote for Gilmour. Bonjour Arlee, and merci beaucoup for the mention! I'm happy that you do a classical piece on your BOTB from time to time because it's my favorite. I love Bizet, but I have not heard this particular opera or aria before. It's wonderful, and the words are sad and beautiful. My vote is for Alison Moyet. To me, her voice is more suited to the music. I thought that David Gilmour sounded a bit strained with the range of the piece. I also really liked the arrangement on the Alison Moyet recording. It felt a bit more intimate, more like chamber music to me. The xylophone (or whatever sort of melodic percussion that was) was a really nice touch. Thanks for introducing me to the piece! Forty, so glad that you enjoyed this fine piece of music. You make valid points I think about the vocal presentations and I agree about the chamber music observation. Another Moyet vote is making this another close race. You have presented a tough choice - at least for me. I don't dare look at their faces, instead focusing on those notes and accompaniments. Alison is the 'trained' voice, I think and really is so beautiful. But David's version is so tender, so scruffy. I actually have chills occurring at the back of my knees. That's always my first clue. I adored David's backup singers. They matched him note for note. Whereas Alison is utilizing more percussion, I think. How many times might I play these? The operatic versions you provided were quite lovely and stimulating. Alison it seems, doesn't fall too far from that 'polished' apple. Maybe I want that pain (of lyrics) to be tender and scruffy... Who knows? My vote is for David Gilmore. Wonderful battle!! If I'm all wrong - it's okay - I'm content! Dixie, well, this isn't something that you can be wrong on since it's your opinion. I agree with the points you make. I do like the back-up singers in the Gilmour version but I also like the way that sound is ethereally replicated by the string section in the Moyet version. Incidentally, in the extra features section of the Gilmour DVD there is a part devoted to Gilmour rehearsing with the singers and that's pretty cool. Like you, I'm conflicted in the choices. I'll tell my vote next Friday. But for now your vote goes to David Gilmour. I enjoyed both David Gilmore and Alison Moyet. I'm going to vote for David Gilmore though because, to me, his voice was better suited for the music. Plus one of my favorite instruments is a Cello and it sounded pitched for his voice. Thanks, Lee. Yes, Judy, the cello kind of grabs me as well. It's among my favorite instruments to hear. Hiya, Lee! I have not heard this opera before. I'm not a huge fan, but I do enjoy it on occasion. This is a beautiful song. I like both covers. David's version has an alluring almost haunting sound to it. Dixie said it gave her chills in the back of her knees. While I didn't get chills, it certainly did pull on me like a magnetic. Alison has a fabulous voice and she keeps her cover in-line with Gigli. I understand why your wife loves listening to her and I certainly could, too. She happens to have that special ability to hold my attention for more than one song unlike many other female artists. As much as I want to vote for Alison, I think I'm going to have to go with David because his passion moved me in the end. Nice, nice battle! Cathy, I think your vote would be what my wife would vote for--she loves watching the song on the Gilmour DVD. Your vote keeps David Gilmour in the lead for now. This is a tough battle, Lee. Both versions are beautiful in their own way. In fact, I feel torn about this one. Alison Moyet sounds more polished. Gilmour is more ethereal and haunting. Sometimes I like not understanding the words. It becomes strictly about the feeling the music evokes. So, for me it's Gilmour. Robin, I agree this is a very tough Battle. In fact, though I have a vote set right now, I could change back before next Friday. I go back and forth on this one. I'm with you about not understanding words sometimes. I think that's something I enjoy about listening to Rock en Espanol. Anyway, another Gilmour vote from you. Hi Arlee, I could listen to both versions all day long. Both are sung with soulful emotion! But, I do love the instrumentation used in David Gilmour's version and the choir used to back him up - beautiful voices! I vote David Gilmour. Sue, this contest is definitely trending right now. Thanks for your vote for David Gilmour. Thanks for the mention of my blog, Lee!! DG appreciates it! I vote for David Gilmore after listening to all four versions. I love the first two for their operatic feel and sound. (I want to see that film with Depp, Blanchett and the others now) However considering it's basis is opera the Gilmore version is more authentic to my ears. I do not like how the English singer uses the gutteral French Canadian rolling of the RRRs - it puts me right off her voice. Too bad. She has a strong voice yes, but I like my French the way the French in France speak it. Also, I visited Bizet's grave in Pere Lachaise Cemetery in France. Hubs loved Carmen. . . Seems like Alison would have picked up the actual French pronunciations since her father was French. I don't know enough about pronunciation to think anything about it, but she sounded authentic to me. But your ears are probably better attuned to French than mine. I've listened to Carmen since I was a child and have always loved the music. My parents had an album of that opera when I was growing up. I'll record your vote for Gilmour. I haven't read any of the other comments yet, so I don't know how this BOTB installment is going so far, voting-wise. In general, I prefer male vocalists to females. Nuttin' sexist about it, just the way my ears hear. However, having said that, it's important to focus on the word "general", since my favorite vocalist of all-time is actually a female: Karen Carpenter. And Mahalia Jackson is perhaps #2 on that list. David Gilmour happens to be one of my very favorite guitarists EVER. Probably within the Top 5. He rarely played anything super-fast and tended not to get all "flashy wid it", but he created memorable moods with all that sustain and the raw, guttural tones. One thing that really surprised me in his recording of THIS song was that he was able to hit those high notes. Without that trademark Gilmour electric guitar sound, and with that nice singing (including the high notes), had I heard this recording on the radio, not in forty godzillion years could I have guessed it was Gilmour. Alison's version is really nice too - even beautiful - but this was another case of my ears preferring the sound of a male voice. That, and the cello on the Gilmour version is what seals my vote for David Gilmour. You hit a home run with this BOTB installment, McBuddy! Now to go see how the others are voting here. Thanks for the great response to this Battle, STMcC. I'm mostly of the same opinion when it comes to male voices preferred over female. Funny how that works. There are a great many female vocalists that I enjoy a great deal, but if you were to ask me my favorite singers the initial ones I'd start mentioning would be male. I was also impressed the first time I heard Gilmour's version of this song. In fact the entire DVD concert is excellent--very subdued and classy. Well worth your time if you are a Gilmour fan. I was delighted to discover this amazing performance by David Gilmour and especially that my wife liked it so much. Another vote for Gilmour who is now in the lead. What do y'all think of Carley Simon? There's a great female voice! Judy, I'm a big Carly Simon fan. Love her voice and her song choices. I have several of her albums. Me too! For some reason the song "I Bet You Think This Song Is About You" is one of my favorites. I listen to it over and over. I'm never sure if it really is about someone particularly or a relative. Diana Krall is another favorite. She reminds me of my all time favorite, Peggy Lee! For years there was a lot of speculation about who the "You" was in that song, with the most popular guess being Warren Beatty. It was finally revealed (not all that long ago) that the "You" was David Geffen. I like that song, too, Judy. You hear Mick Jagger in the background vocals? I liked Alison Moyet's version better. With David Gilmour, I found myself checking the time on it constantly to see how close we were to done. I didn't feel he had the voice for it. Ms. Moyet's version was a lot crisper and the instrumentation was better. Thank you for moving Alison up another vote, John. I understand the reasoning behind your vote. I thought I'd be choosing David Gilmour because I'm a big Pink Floyd fan but I'm going to vote for Alison Moyet. Her version is just so much more powerful. Don't get me wrong, I like David Gilmour's version but I prefer Alison Moyet. Very beautiful piece of music in either case. I didn't listen to the opera because I'm just not a fan. You might want to go back to listen to at least one opera cut to see how faithfully Moyet and Gilmour both covered the song. It's arias such as this that has made me appreciate opera far more now than I used to. Merci, thank you, for noticing and mentioning my blog on yours, Arlee. I knew the other bloggers but D.G. Hudson. I like Bizet very much and will vote for Moyet, although every interpretation is excellent. I'd been waiting to use this song in Battle for over a year now. All of the bloggers specializing in France made now seem like the right time to do it. Thank you for another vote for Alison Moyet. Sadly, I have to admit that Moyet's voice- something about it put me off right from the top. Can't explain it, just a "nails on chalkboard" thing for me. One for Gilmour. CW, well Alison has a sort of deep smoky voice so maybe that's it. I think her album Voice is pretty incredible with excellent takes on classic tunes. I'll have to find the movie The Man Who Cried; I'm sure I will like it. Moyet has a beautiful voice, and loved the musical arrangement, but her version was nothing spectacular - especially after listening to the other classical editions. I love how David Gilmour utilizes so many other people's talents to make his version stand out. Simple, yet elegant; and he has such a marvelous voice. Of course, I am a Pink fan, and David as a solo artist. His musical experimentation is awesome, and always works for me. No surprise he gets my vote today. Donna, Gilmour is one of rock music's greats and I like the fact that he was even willing to do this song. He's not afraid to experiment for sure. Birgit, A live production of Carmen sounds spectacular. Putting you down for a vote for Alison. Having just written a piece about Alison Moyet (Y is for Yazoo), this is such a departure from punk synth/pop. I find her voice soothing, but I also really enjoyed David Gilmour's version as well. I think though, for this battle, Alison wins. Definitely not quite synth/pop. Both versions are really quite good. I'll put you down for Alison. I regret that I only have time to listen to and vote on the blogs of a few of the friends that I've developed through knowing McCarthy. I am sure there are some great other battles going on in the blogosphere, but I just don't have time to listen to them all. But I enjoy the few I do! Lee, this was a really interesting BOTB! You have a way of finding some very obscure renditions of classics done by unexpected parties. This is a beautiful aria. I've seen Carmen several times, and I think that without a doubt it is one of the top three operas ever, and certainly the ONE that - if possible - all those new to opera should see first. The Pearl Fishers? I think I saw once years ago, but I'm not familiar with it as with Carmen. To me, Bizet is certainly France's greatest composer... and that includes Debussy! I was very surprised at seeing Gilmour sing an opera aria. I liked it, and - noting the background music as you suggested - I liked it better than Moyet. Moyet’s accompaniment was not as good. I particularly disliked the use of vibes. I believe that I said this the last time you featured Moyet: I find her voice very annoying. She has that slow vibrato, deep female voice that always earns a NO vote from me! So, Gilmour all the way on this one! I know that if you featured ACTUAL opera arias in your BOTBs, probably a bunch of people would skip voting, but I would like the battle better every time! SB6--To use actual versions of operatic performances would definitely put off a lot of voters since a lot of people aren't opera fans and the differences between performances would be slight to most listeners. My goal in using classical is to find popularized renditions by unique artists. I listened to a number of the operatic versions, but settle on the Gigli version primarily due to the recording date and the quality. I typically like to find the earliest recording with the better quality. Actually, since the operatic version was only for sample I don't think it mattered which one I used as long as the quality was decent. Several people have mention this about Moyet's voice and I can see what you're saying. Often I'm not a fan of huskier female voices, but I often don't care for deep male voices either. I'm surprised that you didn't think the Moyet accompaniment better than Gilmour's. The shimmering strings to me are so ethereal. But so are the voices on the Gilmour version--his back-up is superb. Though I really liked the marimba in Moyet's backing--I enjoy instruments that use mallets when played tastefully. I've seen parts of The Pearl Fishers on the internet, but can't sit through an entire opera on my computer. This opera is not currently available at Netflix. I've been to one opera in my life--Mozart's "Abduction of the Seraglo" and thoroughly enjoyed it. Usually operas are more than I can spend and too much trouble to go to. I don't get out much. Thanks for your vote for Glimour's version. I want to clarify: I don't want you to change a THING about the way you put together these BOTBs! I like them and they are always interesting. I also think that you and I have pretty darned similar musical tastes. I was just saying that - given my love of opera - that I PERSONALLY would really enjoy opera-only battles. One of my pop's favorite albums was "40 Tenors, 80 High-C's" and it featured 40 old-time operatic tenors singing the aria "Di Quella Pira" from Verdi's Il Trovatore. Back-to-back-to-back versions of this short but stirring aria was the ultimate "BOTB" contest! I forgot to add yesterday that Seattle Opera is featuring The Pearl Fishers in its season next year and I already renewed my subscription... so I'll be hearing "Je Crois Entendre Encore" again then! So cool that you'll be able to see "The Pearl Fishers" in person. I'll have to settle for my CD I guess. well you totally seduced me with the yiddish version - what an utterly beautiful voice…..but difficult tho it is, and therefore a bit of a silly challenge, cos they are both great - I prefer Dave Gilmour, because of his wavering uncertainty when singing this - it resonated more for me! So, you seem addicted to challenges - smile - thanks for your follow - I seem to have clicked follow here on the wrong identity, but never mind! Yes, I guess I do have this thing about Challenges. But then life can be a challenge to can't it. Those of us who could never sing like an opera singer (me,me,me) can appreciate Gilmour's real-to-life version. It's always nice to hear someone we grew up singing with try something new and introducing it to us. He's got my vote. David Gilmour shows some pretty fine control in his singing. I'd rather listen to his style than actual operatic singing. A very to the point vote for Moyet. Thanks! The Yiddish version reminds me of when I first met my husband's parents. For my father-in-law's birthday, my husband took us to a musical that was entirely in Yiddish. My in-law's really enjoyed it, as I sat there not understanding a single word. Somehow it didn't matter what language this song was sung in, as you could still feel how deeply moving it was. Since this version is not in the running, my vote is for Alison Moyet. She has a lovely voice, which covers a range of emotions. You've made me think of a documentary I saw a few months back. The Komediant is about the tradition of Yiddish theater. I had no idea it was such a worldwide thing with such a long history. It's a fascinating documentary if you're interested in such things. I agree that you don't have to understand a language with a song this beautiful--the sound of the music is enough. Another vote that helps Moyet. I did notice a lot of bloggers talking about France. I enjoyed all them because I've always wanted to go to France. My vote goes to Alison Moyet. Her voice was fluid and emotional. It seems like every year France has been a theme of at least one or more bloggers. There have been some pretty good ones too. Another Moyet vote is catching her up to Gilmour. Looking to Be a Starr!